The 13th-century Spanish Dominican monk, Raymond of Penafort, was a legal specialist, who wrote also in a new way about moral action and guilt. With his work called the 'Summa', he opened up a field of study on application of general principles of morality to concrete and defined actions of human beings as a way of deciding what ought to be done or not done and also whether an act carries guilt. This copy of the 'Summa' was written at St Augustine's, Canterbury, by William de Newintone. 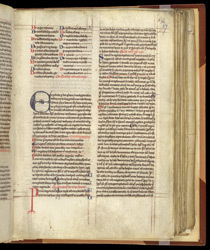 A page from the manuscript shows instructions to the person who applied the colour to the manuscript. To the left, nearly hidden in the gutter of the book, is a small letter 'e', which was the instruction to paint the capital letter across from it. In many of the coloured letters at the beginnings of lines, there is a small letter 'd', the instruction to paint the capital letter in that place. Division of labour was usual in the production of medieval manuscripts by this time, with colour, gold and other decoration being applied in stages, often by different people.